"Please bring me a Batman game and Candy. 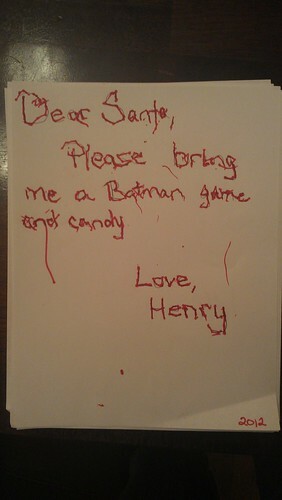 Love, Henry"
Santa has totally got this! **And still, my heart aches for Newtown, CT. I feel like every move I make this week reminds me of families that will not have the chance to do these same Christmas traditions. Last night I couldn't stop crying for the sister of the teacher. Because I see myself, my sister, my family, in that photo. Everyday I cry for the parents, the children, and for the horror of it all. Because it could have been any of us. And because it's Christmas. And man... I just need to say, I am still struggling with it. Hundreds of miles away, I am still crying with Newtown.